Borders, of course, are more than just lines marking territories on a map. They are ultimately an apparatus of the state, functioning to define the outer limits of state power. The extent and intensity of this state power is rapidly changing today — as is the nature of the border regime itself. The involvement of transnational institutions like the European Union, or non-state agencies like Frontex, and the extension in some cases of existing state powers beyond their own borders (as in the case of Australia locating its refugee camps in Papua New Guinea, or the UK placing border guards in French ports) are fundamentally changing the way borders work and the way different groups of people relate to them. As a result, borders have proliferated, shattering into a kaleidoscope of effects, distributed unevenly over space and people. For some, borders are fortresses. For others, they almost do not exist. Borders, in short, are increasingly asymmetrical: sieves and solid walls simultaneously. What does this shattering kaleidoscope of the border regime look like, and what challenges does it pose for struggles for the freedom of movement? On the one hand, we have seen the strengthening of certain borders as fixed lines in recent years. The militarization of the borders between the US and Mexico, Morocco and Spain, or France and the UK all serve to maintain huge asymmetries in wealth and privilege. And militarization here is not meant as an analogy. It means the deployment of military personnel, the use of military equipment — drones, razor wire, helicopters, heartbeat and carbon dioxide detectors, tear gas and rubber bullets — and extensive funding to secure its place in the military-industrial complex. Militarized borders block people’s free movement and can create bottlenecks of and for people. Often, makeshift camps build up in these bottlenecks, where people must then live and meet their basic needs while seeking ways to continue their journeys. These camps, which are sometimes referred to as jungles, both by the people who live in them and by the people who seek to control and destroy them, are an effect of the struggle for mobility. They emerge wherever the forced immobilization of unwanted travellers blocks their freedom of movement. The Jungle that existed in Calais on the northern coast of France from the summer of 2015 until the autumn of 2016 became something of a leitmotif of what was called the “European refugee crisis.” But at that time jungles existed across Europe: from Patras and Igoumentisa in Greece, to the Greek islands of Lesvos and Samos, at the Serbian-Hungarian border, and in Ventimiglia on the Italian side of the border with France. Although there was a mushrooming of jungles at that time, many of them were long-standing — the camps in places like Calais, Melliea and Patras having been around (on and off) since the mid-1990s. Jungles are an effect of the border, but they are also a problem for it, and a crucial organizing tool and resource for the people living there. When the numbers of people stuck in one place is so big as to make them visible and vulnerable, they are, ultimately, the safest and most efficient ways that those people can meet their needs in resource-limited situations. On the other hand, we have seen the deployment of border practices within and beyond the physical borderlines of states, and an overall fuzziness in where their effects start and end. There are a number of ways in which this has taken place. To begin with, there is the introduction of biometrics that use, store and update human data on various transnational databases, meaning that people who move are increasingly traceable, predictable and accountable. The use of biometrics makes it easier for certain people to move (citizens of rich states, highly skilled workers), while filtering out “undesirables.” What is different about biometrics compared to older forms of identification is that it rests on the efficiency of algorithms to be (supposedly) 100 percent accurate, unreplicable and eternal. It makes it harder to move without permission, and crucially, for plans to be enacted successfully, when “data doubles” of us already exist that can predict those plans and then control them. There is also the increased use of “soft” internal border controls. This includes things like ID checks in public spaces carried out by domestic security agencies such as the police. It means that anyone fitting the profile of an “illegal immigrant” risks arrest — turning parks, public squares, train stations and motorway rests stops into places of potential interrogation for some. The way that access to the means of daily life is increasingly index-linked to immigration status is another form of soft border control. For example, teachers in UK universities are obliged to inform on foreign national students who are absent for long periods. Landlords are obliged to check the immigration status of potential tenants before renting to them. This means that the border increasingly infests other areas of life. Within these limited options, people face an ever-stricter and more rigid immigration system itself, where unless you are wealthy or invited, your options are probably limited to claiming asylum — the category of “refugee” also excluding all those who do not fit within the strict (and state-defined) bounds of state persecution. This is not an accident. Uncertainty creates a highly flexible and disposable workforce that, denied access to labor and social rights, can fill the gaps at times of need and be disposed of at times of abundance. As Sandro Mezzadra suggests, “the goal … is not that of hermetically sealing off the borders of ‘rich countries’, but that of stabilizing a system of dams.” In that sense, “illegal migration” is not necessarily a bad thing for the capitalist state. The everyday effects of this institutional uncertainty for the people who are its subject can be extreme precarity: destitution, lack of control, ever-shifting plans, and anxiety. For many, there is a sense of being suspended in a permanent present, where life has yet to actually start. This condition can last for years. 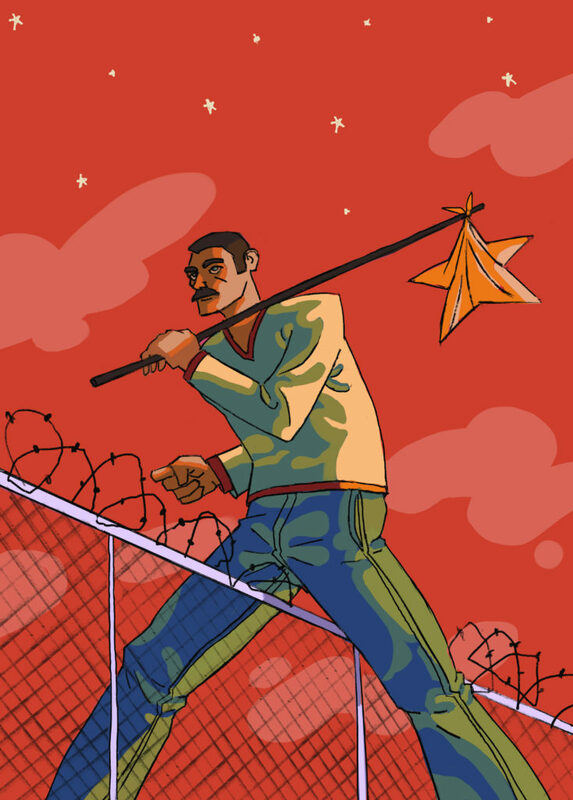 The precarity caused by the border regime largely affects those who move without permission. Struggles for the freedom of movement, after all, largely concern and are made up of such people. But these struggles also involve many people with papers, in solidarity with them — people who are often citizens of rich countries and who benefit from the border regime. A minority of such people have also become the abject subjects of the border regime and faced its controlling effects. One of the side effects of the recent European “refugee crisis”, for example, was that numerous border activists with papers, involved in struggles in places like Calais and Ventimiglia, were banned from certain European countries. With their names added to databases of “known trouble-makers”, such bans made future travel across Europe difficult, facing interrogation when crossing borders, and even possible fines or prison time. The legality of such bans is vague at best, the length and breadth of them unclear, the ongoing effects of a “black mark” on a database often lasting. A number of people in situations like this are currently challenging the legality of these bans in the first place. Focusing on the operations of the border can paint a picture that is devoid of struggle. This is clearly not an adequate representation of reality. As much as contemporary borders are sophisticated and multi-faceted weapons against free movement for all, the border regime is a product of resistance to and subversion of it at every step. The border regime does not change of its own accord, but is forced to adapt to the ever-changing strategies of people who seek to reclaim or defend their freedom of movement. Control is there because people have continued to move despite already-existing, incomplete controls designed to stop them. In every case, people have gone on to enact new strategies that subvert those new control measures. People without papers find different ways to evade controls. Control responds with new strategies of capture. People respond. And so the process continues. People who move without permission therefore actively affect the existing border regime and are not just passive victims swept up in its wake. It is worth remembering, for example, that the vast majority of those people who were the subject of the spectacle of the European “refugee crisis” have, by and large, blended into Europe’s social space somehow. Borders don’t have a monopoly over people’s movement. The border regime, in short, is forced to adapt because of the actions of people. This includes organized and visible, expressly “political” acts by people with and without papers (the numerous demonstrations, protests, hunger strikes, vigils and marches). But more often it includes daily strategies of invisible non-subordination and quiet evasion carried out by people who refuse to allow borders to stop them from moving. It is the people maintaining safe houses in towns and cities on travel routes across the continent; the WhatsApp groups that share information on the best routes for travel; the routines of sharing resources and information that take places across the jungles of Europe, that make such places crucial resources for the people living there, and a problem for the border regime. Such actions often create moments or spaces of autonomy from a system designed to stop them. Whether created by force or by choice, these spaces or moments are a problem for that system — because they are subversive. They enable people’s continued “inappropriate” or unauthorized movement. They facilitate peoples’ “escape” from control. In that, they amount to a creative force that continually reshapes a border regime that seeks to capture and discipline it. They are strategies, not of getting by within the system, but getting by outside of it. In the necessary invisibility of these actions, the people carrying out these quiet evasions do not constitute themselves as a social movement in the traditional sense. There is nothing to see, no audience to address. Often this part of the struggle for free movement is not even seen as a practice of politics. Generally, people think of politics as an intentional and collective power-play in the public realm, and these actions are neither (or rarely) collective or public. Even the intent to bring about political change is missing. People do not come to Calais or Athens to make a political statement, after all — they come to keep moving. Any political change is, to a large degree unintended. All this makes it hard to think of migrants’ mobility as inherently political, if what we think of as political is intentional activity. And yet, these actions make demands, and are the driving force behind structural change in the border regime. What this means is that there is an additional challenge for — and an additional border within — the social movement for free mobility. It is the way we perceive what is political and important about this struggle. These everyday acts of escape are often less valued than the more expressly “political” parts of this movement. They often go unrecognized as resistance by the movement itself, and by those who view and comment on it. This weakens the movement. Behind all the headline-grabbing actions are all those numerous micro-resistances and everyday, even mundane, subversions. We need to better recognize that struggles for the freedom of movement take place at the everyday level of life-making, as well as in the “big-P” political actions of demonstrations and press statements. Borders are changing, shattering into a kaleidoscope of different effects, and posing numerous challenges for struggles for the freedom of movement. But these struggle are taking place all around us, not just in places like Calais, but right on our front door. The struggle for the freedom of movement is not planned for the future. It is happening right now.